AustStar Motors is Brisbane’s leading independent Mercedes-Benz specialists. AustStar Motors provides specialised mechanical and value-added services to Mercedes-Benz owners in Brisbane with exacting quality and at a fraction of dealership pricing. They are a family-run business with the plan to grow. With such a great market position, service and reputation AustStar needed our help to create a brand and online experience that truly reflected their business. We started at the beginning with AustStar and work on their Branding. We realised that glitzy, futuristic elements of their existing brand were not going to cut it in a market place of discerning, image conscious clients. We need to create something altogether more elegant, timeless and appropriate for a business servicing cars of Mercedes’ calibre. So a new logo, colour scheme and typographical style was devised and then deployed. This lead to new business cards, promotional materials and, of course, a spanking new WordPress website. We’re very pleased to say that our relationship with AustStar didn’t end there. We have subsequently been involved in the design and production of advertisements and digital marketing campaigns. This has included billboards (digital and traditional), newspaper ads, social media content and even sponsorship of the local soccer club! Read more about the creation of the new AustStar brand. 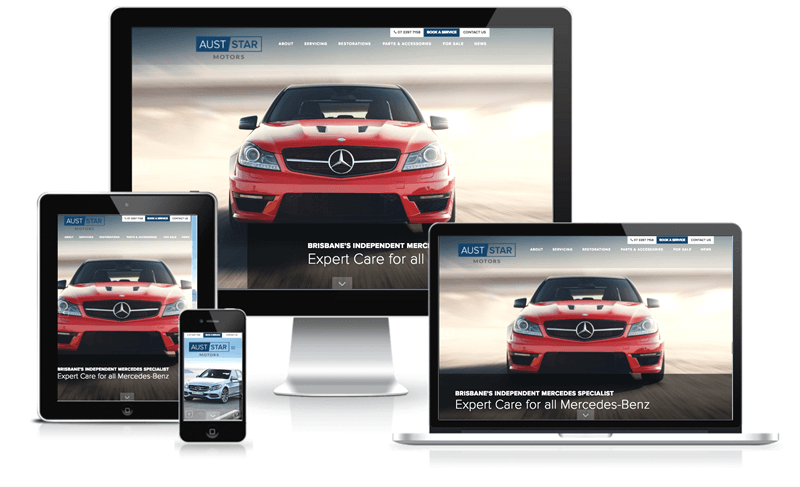 Not only have we completely changed the branding appearance of AustStar Motors, we have also massively increased their visibility in the marketplace. How do we know this? Well the stats speak for themselves: the website now receives 141.37% more traffic and the service bookings are higher than ever, especially from new customers. Proof that good branding design and implementation really does work.